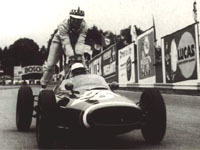 After the Intercontinental formula failed to get off the ground, 1961 was the first season of the new 1.5-litre formula. 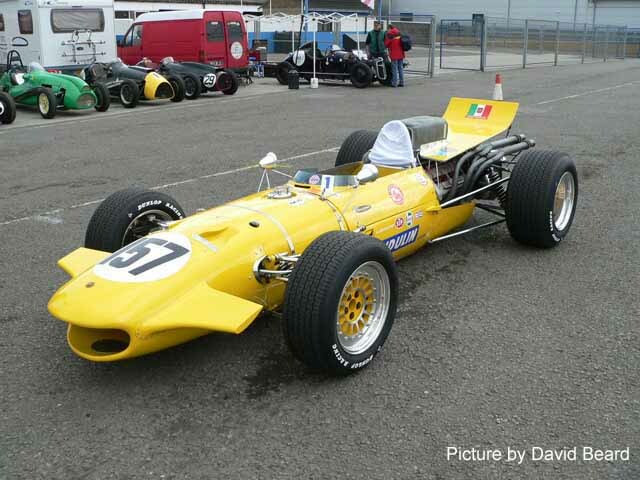 Although the British weren’t fully prepared the former Formula 2 saw an influx of an intriguing variety of cars. 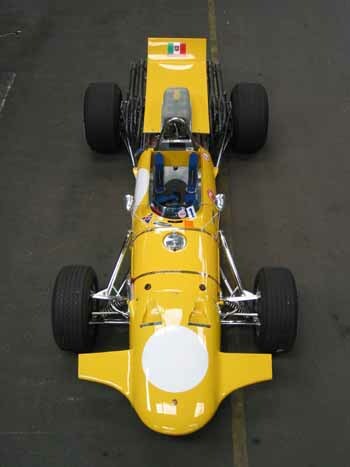 Apart from works teams from Ferrari, Cooper, Lotus, BRM and newcomers Porsche, most privateers chose the tried and tested route to enter their customer Cooper and Lotus chassis. Others pioneered a more adventurous route with chassis from such as Emeryson and De Tomaso. And then we had the Gilby and the JBW, both developed and run by self-minded men trying to do Grand Prix racing off the beaten path. There was one Italian team that explored all three avenues. Its name was Scuderia Serenissima. Serenissima – the old name for the Republic of Venice – was founded by Giovanni Volpi di Misurata, a young Venetian count who had just inherited a large family fortune from his father Giuseppe Volpi, one of Italy’s foremost financiers. 24 years of age in 1961, Giovanni had entered the World Sportscar Championship in 1960 with various Ferraris, having worked out a lucrative customer deal with the Commendatore, often being the first in line. 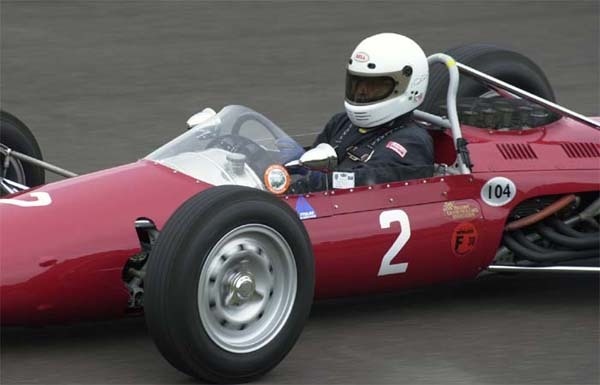 That didn’t stop him from entering other cars, though, such as a Maserati-engined Cooper ‘Monaco’ – and that theme continued into 1961 when he expanded into Grand Prix racing. As the teams raced in selected World Championship events and many of the minor Italian and French F1 events, it’s hard to find any other team that bought and rented a bigger variety of Grand Prix cars. Or worked with a bigger variety of drivers, for that matter, as the team’s regulars Giorgio Scarlatti, Nino Vaccarella and Carlo Maria Abate were backed up by the likes of Roberto Bussinello, Umberto Maglioli and Maurice Trintignant. Merchants of Venice indeed. The 1960 Buenos Aires 1000kms DNS for Abate/Toselli’s Ferrari 250 GT LWB having been the first sign of Scuderia Serenissima on the international stage, veteran Frenchman Trintignant became responsible for Serenissima’s first appearance in a World Drivers Championship points-paying event, the famous 1961 Monaco GP. As was now usual, Monaco would be the championship’s season opener and there they were, the final name on the entry list, a moment that will have made team manager Nello Ugolini proud. Linked with Venice through his part-time management duties for AC Venezia, the Venice soccer club, Ugolini had teamed up with Volpi after illustrious management periods for Alfa Corse in the thirties, Ferrari in 1953 and ’54 and Maserati after that. The team had already raced at Pau with Trintignant, using three-year old Climax-engined T45 chassis F2-9-58, but had now switched to the slightly less ageing Maserati-engined T51 F2-1-59, which the Frenchman had campaigned at Syracuse. It would remain with the team for Spa, Reims, Solitude, the Nürburgring, Modena and Monza, while Nino Vaccarella would drive it in the late-season Coppa Italia at Vallelunga to score the team’s best-ever result with third. This was the race that became famous for Giancarlo Baghetti’s fourth and last F1 win. At Monaco they would have to take up the other privateers trying to get into the race. Some would be out of their league, such as the Walker team and BRP, which had their Lotus 18s worked on by their engineering wizards Alf Francis and Tony Robinson to create the hybrid 18/21 – later on, we’ll come back to the significance to this story of Alf and Tony’s cooperation. Building on Trintignant’s experience, Serenissima were expected to fend off the Belgian Emerysons – even though there was one place less to fight for given that Jack Brabham, two-timing at Indianapolis, would be guaranteed a slot on the starting grid. But would they beat the Cooper run by Camoradi for Masten Gregory? In the end two-time Monaco winner Trintignant also outqualified one of the BRP cars to line up 15th on the grid, and he nearly took a point as well if he’d had more time to catch McLaren’s ailing works Cooper. 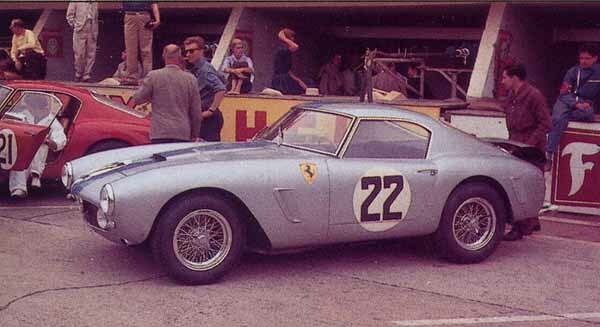 The 250 GT SWB was the mainstay of GT racing during the early sixties, and Serenissima was a prolific user. This is the Ecurie Francorchamps car at Le Mans in 1960, as raced by Belgian 'Elde' (Léon Dernier) and Frenchman Pierre Noblet. Back in Italy, the Gerini/La Pira 250 GT SWB finished 12th in the Targa Florio, but the Maserati-engined Cooper T49 ‘Monaco’ driven by Colin Davis and Raffaele Cammarota failed to finish. The same applied to yet another form of variety in their stable, Giovanni Giordano and prince Gaetano Starabba retiring their OSCA MT4 after five laps. Abate and Davis shared the 250 GT LWB at the Nürburgring to finish a class-winning 8th. On the next occasion at Sebring, in early 1961, Americans Gaston Andrey, Allen Newman and Robert Publicker ran the car home 12th overall and second in class. A second entry for Tavano/Arents, 250 GT SWB chassis 2455, ran into diff trouble early on. Then it was on to the Targa Florio, where Serenissima entered a ‘Birdcage’ for Vaccarella and Trintignant, the man who had raced Serenissima’s Cooper T45 at Monaco, the pair finishing fourth behind the Trips/Gendebien Dino and the two works Porsches. The second Serenissima Tipo 63, driven by Maglioli/Scarlatti, ran them home fifth. Abate returned to the team for the Nürburgring 1000kms, sharing another 250 GT SWB with Colin Davis to finish a splendid fourth, beating the works car of Mairesse/Baghetti, while the Scarfiotti/Vaccarella and Trintignant/Maglioli ‘Birdcages’ retired. 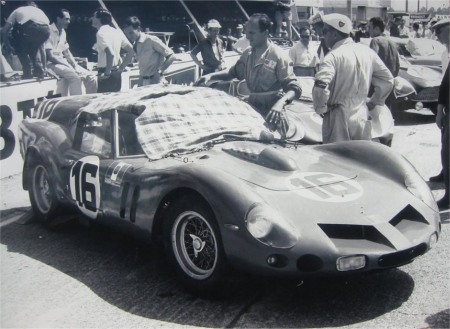 Abate then shared a 250 GT SWB at Le Mans with Trintignant, but the car retired with gearbox failure after 13 hours. The second-string Frescobaldi/Cammarota Fiat-Abarth 700S retired after 124 laps. In Pescara’s four-hour race Jo Bonnier and Renato Pirocchi also made appearances for the team, to further add to the Scuderia’s impressive tally of henchmen. The Maserati Tipo 63 was an evolution of the original 'Birdcage'. Serenissima often ran Vaccarella in these cars. 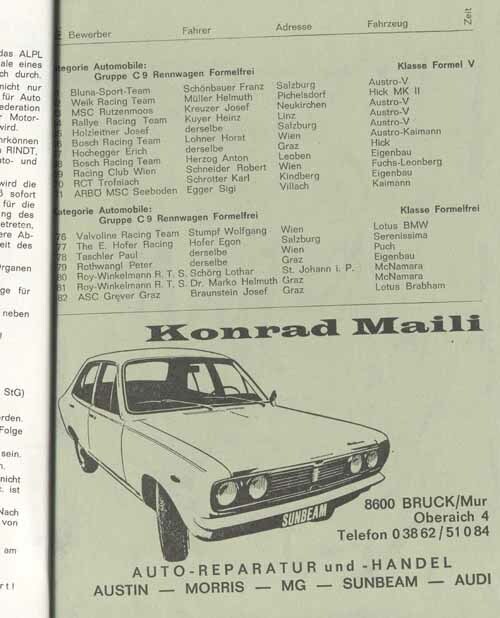 was an earlier 4-cylinder version. Vaccarella's gearbox broke. 1962 would be a year of transition for the Scuderia – and not just Serenissima’s, but Ferrari’s as well. In fact, there would be a huge influx of Ferrari employees that led to Grand Prix racing’s biggest disasters as well as one of sportscar racing’s wonder stories. That’s because the shocking mass defection from Ferrari led to not just the embarrassing ATS F1 effort. Working with the same crew Serenissima was also the driving force behind one of the most mesmerizing coachwork creations ever, a Ferrari 250 GT SWB-based shooting brake, better known by its illustrious nickname ‘Breadvan’. The story of Laura Ferrari causing eight key members of Scuderia Ferrari’s technical staff to leave after the victorious 1961 season is told extensively elsewhere, so let’s suffice by telling that the hotbed of intrigue caused team manager Romolo Tavoni, chief engineer Carlo Chiti and others including World Champion driver Phil Hill, sportscar development chief Giotto Bizzarrini and sales manager Girolamo Gardini to hit the road once the Old Man refused to give in to Gardini’s ultimatum and have his wife barred from meddling with the team’s affairs. Some say that Ferrari’s downturn in form in 1962 was a direct consequence of the palace revolt but many feel that Ferrari would have been overtaken by the British teams anyway. This view is certainly supported by Volpi: “Chiti was still heady about the '61 season. Ferrari, instead, knew his own cars would be crawling in '62 and they did.” The view is vindicated by the fact that the youngsters thrust into the limelight managed to turn the 250 GTO sportscar into a legend. Sure enough, the base design by Chiti and Bizzarrini had been excellent but it was far from finished when they left. It was the contributions of Mauro Forghieri and the slick new bodywork by Sergio Scaglietti that made it a Jaguar E-type beater. The ATS Tipo 100 was recently restored. It now races in various historic events. Here it is seen during the 2003 Revival Meeting at Goodwood (photo by Frank van de Velde). The road car project, meanwhile, resulted in the 2500 GT, a small coupé powered by a Chiti-designed 2.5-litre V8 putting out 245hp. The Michelotti-built car was reported to reach a top speed of 160mph but only 12 of them were built. As ATS’s racing arm, the Scuderia SSS Repubblica di Venezia had already been busy in Grand Prix racing, having acquired an ‘Alf Francis’ Lotus 18/21 (chassis 912) before renting a brand new 24 (chassis 941), both from Rob Walker. Vaccarella ran the 18/21 at Brussels, Pau, the International Trophy and Monaco and failed to impress but later in the year he qualified the 24 at Monza and managed to finish ninth, his highest finish in a World Championship event. To add to his outlandish collection, Volpi also bought the ex-factory Porsche 718-203 from Juan Manuel Bordeu, who had raced the car at Vallelunga in May. He put his friend Carlo Abate on board at Napoli and Pergusa, while Vaccarella drove it in the German GP. Jo Bonnier was its main user, racing it at Brussels, Snetterton, Pau, the International Trophy, Mallory Park and Reims. The 24 was returned to Rob Walker for Ricardo Rodriguez to race in the inaugural Mexican GP – with tragic consequences. But what about sportscars? Of course, when Giovanni Volpi decided to back the Ferrari fugitives, the Commendatore refused to do any further business with him. But why should Volpi have cared? He had a full stable of sportscars from Maserati, De Tomaso and Porsche, and now he had the great minds behind Ferrari’s all-conquering F1 and GT designs at his disposal. And yes, in the end a Volpi-commissioned car would shine at Le Mans in 1962, but it wasn’t entered or supported by ATS. This is where the ‘Breadvan’ story starts. At the start of 1962, Serenissima entered a 250 GT SWB for Gendebien in the Daytona 3 Hrs, a Testa Rossa for Jo Bonnier and Lucien Bianchi at Sebring (which they won by 10 laps!) and a Testa Rossa for Abate at the ‘Ring (which he crashed out). 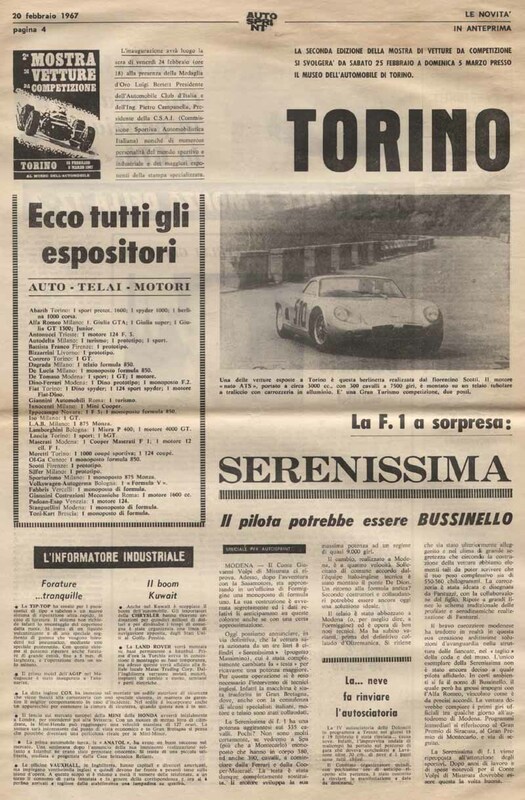 Another good result was third for Vaccarella/Bonnier in the Targa Florio, racing a Porsche 718 GTR to finish first in the 2-litre prototype class, while Hans Herrmann and Herbert Linge finished sixth overall in their Serenissima-entered 356B Carrera Abarth GTL, taking the 1.6-litre GT class. Sadly, the team’s Maserati Tipo 64s fared worse. By then, Le Mans was waiting around the corner and the 250 GTO was the car to have. However, because of Volpi’s earlier ‘betrayal’ Enzo Ferrari was to have none of it. With the help of Piero Drogo, Bizzarrini needed a mere 14 days to create one of the world’s most famous ‘bitzas’. Taking 250 GT SWB chassis 2819 (which had shone in the 1961 Tour de France in the hands of Gendebien, because of its special Tipo 168 Competizione/61 engine) as a base, he added GTO features such as dry sump lubrication, six dual-throat Weber 38DCN carbs, GTO wire wheels and tyres and a lower and more rearward engine position (completely behind the front axle) compared to the GTO’s predecessor. At 935kg the car also happened to be some 200 pounds lighter than a GTO. And, of course, that body. A GTO from the front, the car got a ‘Kamm tail’-style rear end which gave it its shooting-brake looks. The body was built at Piero Drogo’s coachworks, which gave the car its official competition name of 250 GT SWB Drogo. (The same name was carried by 250 GT SWB 2053, which had originally been the GTO prototype and was also given the Bizzarrini/Drogo treatment, but with slightly different results.) Aerodynamic efficiency – also found in other parts of the car – was at the heart of the solution but because of that peculiar boxy behind and that cute little delivery window at the back the car with MO 6 8939 license plates (later Prova MO74) thoroughly deserved its English nickname ‘Breadvan’. The French called it the ‘Camionnette’. The 'Breadvan' in the Le Mans pits in 1962. Being a ‘new’ design, it was put in the 3-litre prototype category by the ACO, obviously nudged in that direction by Ferrari. So although the car crewed by Abate/Davis didn’t race the GTO’s in class it thoroughly beat them on the road – until its driveshaft broke four hours into the race. It had been building up a sizeable lead and was running with the rear-engined Ferrari prototypes. However, it almost hadn’t raced at all. Varyingly called the Jungla GT or 308V, the 850kg car was built at Carrozzeria Gransport in Modena. Its alloy bodywork was penned by Francesco Salomone, formerly the chief designer at Pininfarina. All the technical detailing was done by another former Ferrari man, Girolamo Ferrari Amorotti (usually known as ‘Mino’ Amorotti), while the engine and gearbox construction was put in the hands of Sasamotors of Modena, a company owned by Girolamo Gardini, one of the Ferrari defectors who had also left ATS prematurely. Its first incarnation was tested by Luigi Bertocco at Modena Aerodrome on December 20, 1964, under pouring rain. It didn’t go quite as planned. In his guise as a motor racing journalist, racing driver Paul Frère voiced severe criticism of the 308V. Unhappy with the results, Massimino and Salomone went back to the drawing board to return with a heavily revised car featuring a shorter wheelbase and entirely new and sleeker bodywork. Dubbed the Jet, this chassis was extensively tested all through 1965 and and soon thoughts surfaced of going motor racing with it. 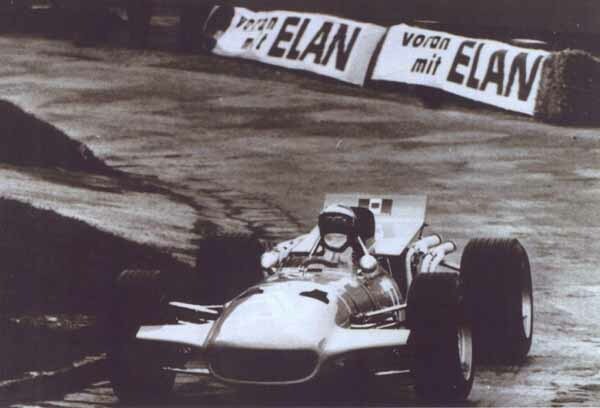 Sometime during 1965 Volpi signed an old acquaintance as his first driver: Juan Manuel Bordeu. Eventual production of the road car started in 1966, while the factory also worked on a racing version called the Jet Competizione. This made its first public appearance at the Le Mans test days in April. Louis Corberto set a best time that was two seconds of Volpi’s old 250 GTO. After that disappointment, the new closed bodywork was ditched again, and another famous Modena coachbuilder, Medardo Fantuzzi, was set to work on an open version. Massimino meanwhile enlarged the engine’s capacity to 3.5 litres. 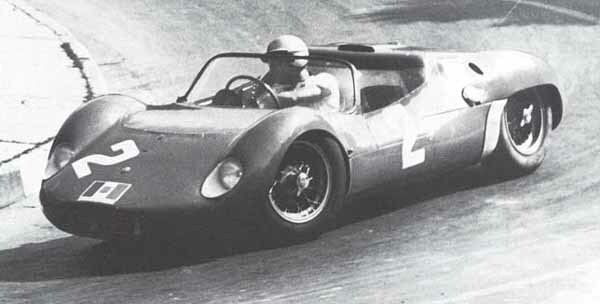 Fantuzzi’s Spyder not only made it into production, its racing version made the grid for the 1966 Le Mans 24 Hours. Entered as the ‘Serenissima Spyder’, the No.24 was run by Scuderia San Marco – another Venetian allusion there – and driven by Sauer/De Mortemart. Sadly, it didn’t go any quicker than the closed-top version, and the car was retired after just four hours, having suffered from a broken gearbox. The original Jet Competizione was run in an Italian hillclimb where it finished second in the prototype class. Was there any more to come? 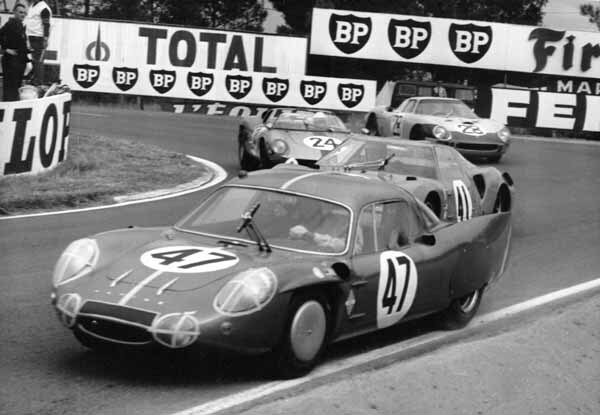 the Servoz-Gavin/Beltoise BRM-engined works Matra M620 while leading the ENB Ferrari 250LM of Gosselin/De Keyn. No, that was it. Suddenly, after a phone call from Bruce McLaren, there were other plans with the 3-litre engine in the Jet Competizione. Four years after having left F1 disillusioned, Volpi and the Serenissima name found themselves right back into it. And this time they made it into the World Championship annals by virtue of scoring a point in the British GP. At the start of the ‘Return to Power’, as the new 3-litre F1 era was hailed, Cooper lead driver McLaren had decided to follow in the footsteps of his former number one at Cooper, Jack Brabham, and build his own racing cars. His first result was the M1 CanAm car but he quickly made his intentions known by hiring Robin Herd to create the M2. Hampered by the lack of suitable 3-litre engines, just as many of his Grand Prix rivals, McLaren’s first choice was the Traco-Ford Indy engine and he raced it at Monaco. This proved to be rather unsatisfactory. Looking for other options, the Kiwi stumbled onto Volpi’s 3-litre powerplant and asked whether he could use it for his F1 car. In June, right at the time when the open-top Serenissima failed to impress at Le Mans, its tintop Competizione sister had its engine removed, which was then bolted onto the back of McLaren’s M2B/2 tub, personally supervised by Bruce himself. 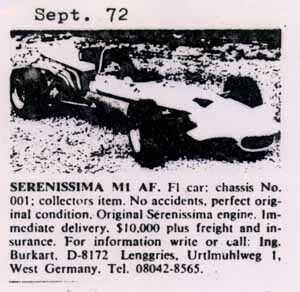 The McLaren-Serenissima M2B was born. Debuting the car at Spa, McLaren set a time good enough to start last (16th) on the grid but he was a non-starter after the engine had its bearings fail in practice. Skipping France while waiting on a engine rebuild, McLaren was back at Brands Hatch in July where he managed to qualify the car in 13th position. And while the engine would suffer another failure in practice at Zandvoort, it miraculously held out at Brands, taking McLaren to an unexpected 6th place and the final championship point of the British GP. The Zandvoort DNS meant another DNA at the ‘Ring. 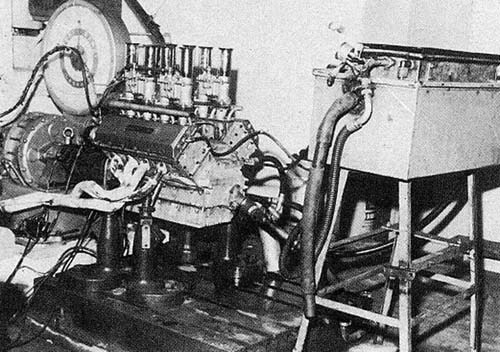 For Monza, Serenissima offered a new engine with a different bore and stroke of 91.5x57mm but McLaren declined and stayed home. 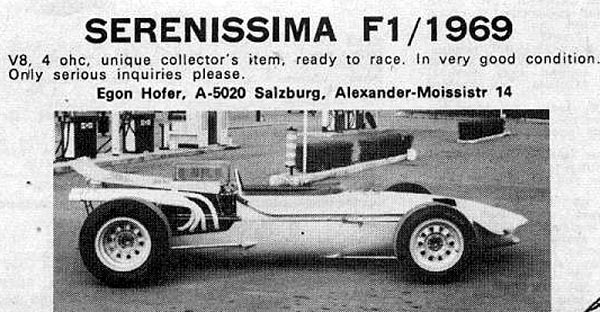 That was the end of the road for Serenissima as an F1 engine supplier, as McLaren reverted back to his Ford Indy engine for the end-of-season cross-Atlantic races in the USA and Mexico before striking a BRM deal for 1967. Meanwhile, around the time of the original McLaren deal, Alf Francis – yes, him again – had joined Serenissima. Originally planned to help Massimino develop the engine, he quickly set about creating a proper Serenissima F1 car. 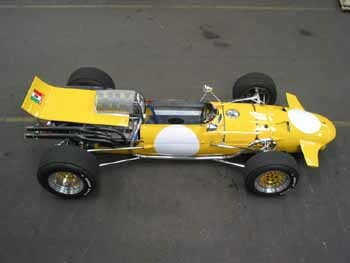 Fantuzzi was hired again to design the body to go around the chassis and the engine that McLaren declined to use. It was painted in a striking bright yellow colour. There is much confusion over the chassis that formed the basis of the still-born M1AF. Some say that McLaren delivered one of their cars – said to be the first McLaren F1 chassis – at the end of 1966, as a payment ‘in natura’ in exchange for the Serenissima V8 engine that was put in the back of the M2B. This McLaren tub was then adapted by Alf Francis to house Serenissima’s V8. In this theory, the type designation is explained as ‘M’ recognizing the McLaren heritage and ‘1’ being the chassis number, with ‘AF’ obviously standing for ‘Alf Francis’. Most experts now dismiss this theory, pointing to the agricultural suspension set-up compared to McLaren's. 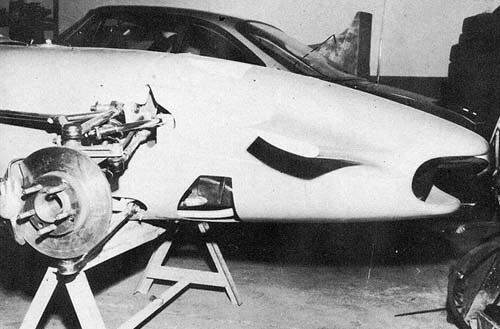 Others theorize that Lola built a monocoque for Serenissima, but in his book on Stirling Moss manager and BRP co-fouder Ken Gregory, Managing a Legend, Robert Edwards makes a case by suggesting that the first proper BRP chassis, 1/63, was in fact hacked by Francis to make the Serenissima engine fit. As we saw earlier, Francis and BRP's chief engineer Tony Robinson already worked together on the Lotus 18/21, so the idea does make some sense. This theory is now common knowledge and seems reasonably plausible, as Edwards goes into quite a bit of detail as to the work Francis had to do to match the engine to the chassis. The work started right after 1/63 was sold to Francis in August 1966, shortly after he had joined Serenissima. 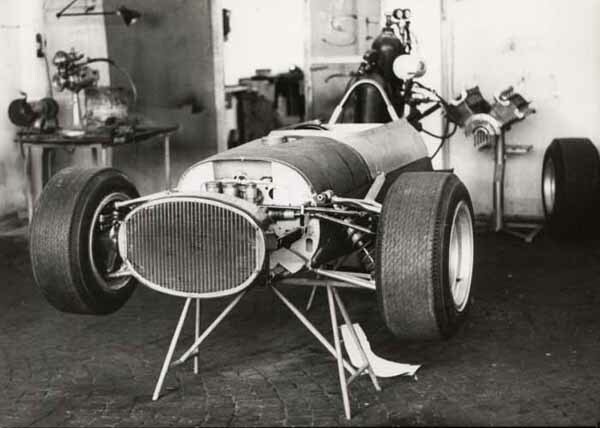 It meant cutting away the rear part of the monocoque and substituting it by a relatively crude frame. 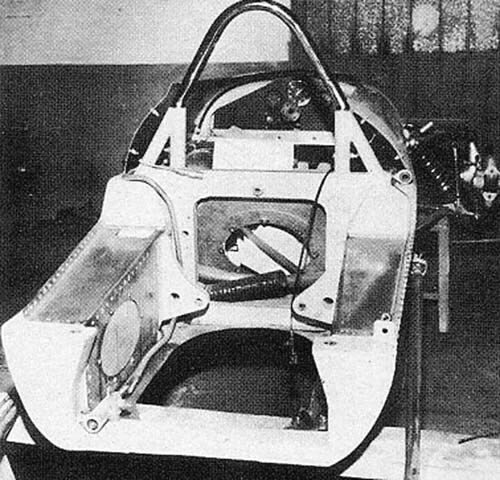 According to Edwards other modifications included a divided de Dion rear suspension and extremely crude front wishbones. A fourth theory says that Francis built the car all by himself. The M1AF in Serenissima's workshop at Formigine in 1967 (photo by Peter Coltrin). 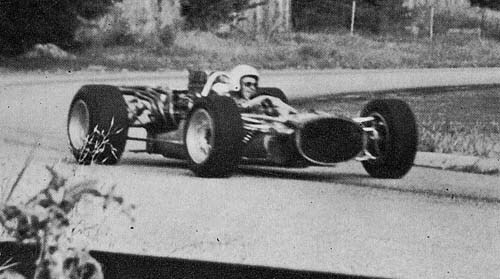 The F1 car made a final appearance during a racing car exhibition at the 1969 Italian GP, after which it was shipped to Austria. 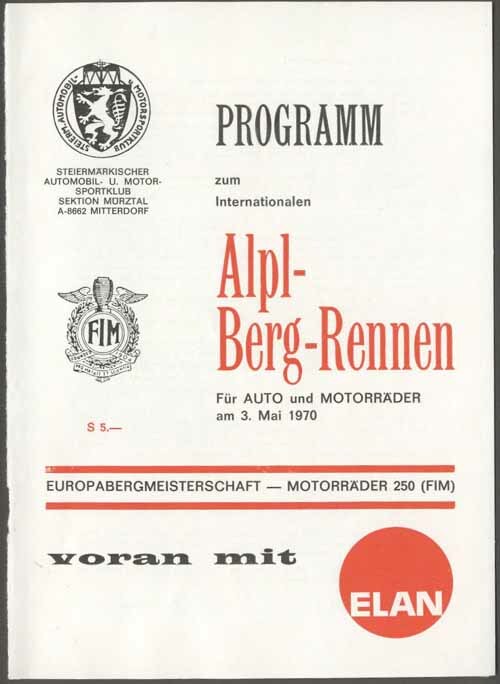 Egon Hofer, its new owner, thought it was a 1969 car and advertised it as such when he put it up for sale in 1971, having unsuccessfully campaigned it in the 1970 Alpl-Berg-Rennen, a hillclimb in Austria. He is seen in action here (picture courtesy of the Egon Hofer Collection). After that, it exchanged hands numerous times – such as in 1972 and 1981 – before ending up in the hands of the current owner’s father. Already in a bad state, it was put in the back of a shack. His son Nicolas Schönleber discovered the car and started restoring it. It now appears on various historic motor racing events, such as here during the GPlive event at Donington Park in 2007. The M1AF as photographed in the Schönleber workshop in 2006 (pictures by Flavia Schönleber). Giovanni Volpi di Misurata closed down the Serenissima workshop in 1970. Alf Francis negotiated the takover of the premises with Georges Filipinetti. And that was the end of the line. Today, Giovanni Volpi is said not to own any of the wonderful cars that his team ran or his factory built, stating that the memories are worth more than any precious metal on wheels. It’s not hard to see his point of view. He’s been there and done it. How many of us can say that they’ve owned and ran two Grand Prix teams, priceless GT cars and two sportscar factories, having worked with the likes of Chiti, Bizzarrini and Fantuzzi? Volpi’s talked the talk and walked the walk. Good for him. With thanks to Nicolas Schönleber.